Snow White is a princess of noble birth who is forced into servitude by her jealous stepmother, simply known as: the Queen. 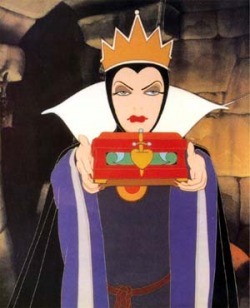 The Queen would daily ask her Magic Mirror "who is the fairest one of all." The mirror would always answer that the Queen was, pleasing her. Then one day the Magic Mirror informs the Queen that Snow White is now the fairest one of all, which royally displeases the Queen. Vain, bitter and jealous of the beauty that Snow White possesses, the Queen attempts on numerous occasions to get rid of Snow White. Not the most practical way to handle being jealous of a girl that is prettier than you. Ursula, the former ruler of Atlantica, is now the villainous Sea Witch, a cecaelia banished by Triton long before the film's events. After getting Ariel's voice, she tries to marry Eric under the identity of Vanessa. Ursula is an octopus person sea witch who "helps" unfortunate merfolk to achieve her own goals. When Ursula first appears in the film, she states through monologue that she once lived in the royal palace of King Triton. She was banished from Atlantica and made her home in the remains of a leviathan where she waits the chance to get her revenge on Triton and become Queen of Atlantica. She envies Triton and wishes to rule Atlantica herself. Scar, because he is a jealous sook and wants to be king of Pride Rock, murders his own brother and attempts to murder his nephew. A nephew that appears to love him. 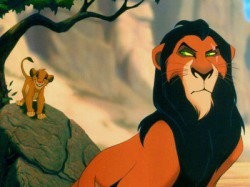 Bottom line: Scar is a straight up envious jerk. 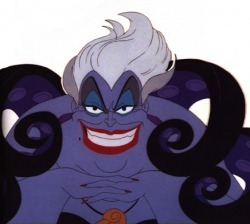 At least the Queen and Ursula had not blood relation to the people they were jealous of and wanted to kill. Snow White: Through a textual prologue the audience is told that Snow White is a princess living with her stepmother, a vain and wicked witch known only as the Queen. Fearing Snow White's beauty, the Queen forced her to work as a scullery maid and would daily ask her Magic Mirror "who is the fairest one of all." The mirror would always answer that the Queen was, pleasing her. Few people can grow up within today's society without knowing the tale of Snow White. From the Grimm Brothers to Disney, it has been told and retold to children throughout the ages. However, what is often overlooked are the true meanings within the story. Fairytales typically have underlying messages that can be found written between the lines, generally in terms of the key themes. Snow White discusses the themes of envy and beauty, and shows how humans' obsessions can lead to their own downfall as well as the harm of others. When focusing on the relationship between Snow White and her step-mother the Queen, it is evident that the combination of these two themes results in a power struggle in which beauty is seen as a commodity and is the basis for the step-mother's envy towards Snow White. From the very beginning of the tale it is obvious that the Queen is obsessed with beauty, "the King took another wife, a beautiful woman, but proud and overbearing, and she could not bear to be surpassed in beauty by anyone? "(Grimm and Grimm 166). Further evidence of her narcissism is her daily ritual in which she consults her magic mirror on who is the most beautiful person in the kingdom. As she repeatedly expects the answer to be in her favor, she is outraged when it appears that Snow White has surpassed her. This information drives the Queen to hate Snow White and soon she orders her death. By looking at beauty as a commodity through which power can be gained, this action can be interpreted as a means for the Queen to preserve her power through beauty. The fact that Snow White was beautiful may not have been reason enough alone to kill her, but the fear that Snow White could use her beauty in order to usurp power from the Queen was. After all, Snow White was young and beautiful, and the Queen would only deteriorate with time. The Little Mermaid: The article What the Bible Says about Evil says that "We need thrills to ameliorate the tedium. We need evil to locate our good" (56). If we did not have the former evil ruler of Atlantica, Ursula, to compare, would we know how good the current ruler, Triton, was? Ursula is envious of Triton because he now lives in the underwater palace she claims to have once occupied and this envy drives her to ruin the life of Triton`s youngest daughter, Ariel. However, her attempts to destroy Ariel and Triton eventually lead to her own demise. The Lion King: Essentially it is Hamlet with lions and a happy ending. Scar, envious of his brother, Mufasa (the current king of the Pride Lands), and his nephew, Simba (the future king of the Pride Lands), plots to have both his brother and nephew killed. He successfully kills Mufasa and believes to have had Simba killed (though Simba only flees off with Timon and Pumbaa), leaving him as the king. According to the "Top 100 Movies of 1994," The Lion King " became the highest grossing motion picture of 1994 worldwide, and the second highest in the USA. "Hal Hinson of The Washington Post called it "an impressive, almost daunting achievement" and felt that the film was "spectacular in a manner that has nearly become commonplace with Disney's feature-length animations", but was less enthusiastic toward the end of his review saying, "Shakespearean in tone, epic in scope, it seems more appropriate for grown-ups than for kids. If truth be told, even for adults it is downright strange." Though envy is certainly not the only sin represented in the film, researcher Stephen Glickman wrote: "In both Hemingway and The Lion King there is an emphasis on greed, gluttony, and stupidity that is ultimately designed to be comical," it is Scar`s envy that drives the story. It is his envy of Mufasa that kills Mufasa, causes Simba to leave the Pride Lands, and ultimately kills Scar.